There are many alleged Song dynasty pieces being offered for sale on-line. Some of them authentic, some of them not. The prices asked could of course always give a clue to the possibly authenticity. 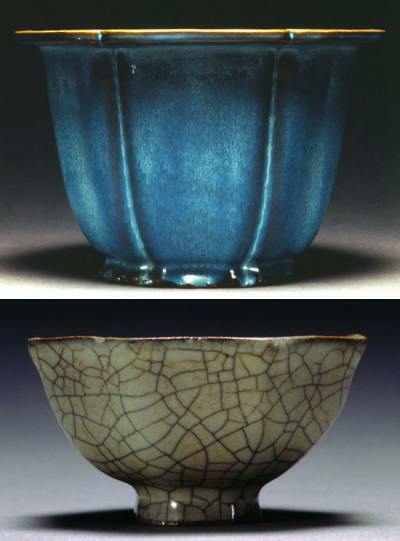 A Northern Song dynasty Jun glazed flower pot recently realized US $ 290 000 at auction (top right) and a Southern Song Dynasty Ge glazed bowl, US $ 156 000 (bottom right). With those prices in mind, it is understandable that it is tempting to offer $30 for something that just might be genuine. Naturally, there is also the actual possibility that a real one eventually will slip through, since everybody assumes that could never happen - and therefore have not looked close enough. What to look for, then. First, there are no way around that you must be acquainted with what to expect from the style, shape, and general characteristics of the real thing. You do must be aware of the type of clay used for each type of ware and know what the specific glaze should look like as well as the look and feel of a proper foot rim. Some wear is to be expected and these sometimes infinitely small scratches should all go in different directions and not all of them in the same as if added by a sanding paper - which might be the case if the piece has been willfully "aged". A close examination might also reveal the use of a sharp, modern tool, mold imprints where there should be none and the evenly circular traces caused by the piece being turned on a electrically powered potters wheel. The secret trick of the professionals is then to examine the glaze with a jeweler's loupe for the bubble structure. The thing to look for is that the bubbles should not be uniform in size or spacing. In a 10 X jeweler's loupe they should appear somewhat irregular and with erratic spacing. Modern copies do not exhibit these variations as they are mostly fired in better-controlled kiln environments where the temperature could be held up with fewer fluctuations than in the ancient kilns. This would help you sort out most recent fakes and to some degree Qing dynasty copies. This is the best I can do in terms of general advice. Bear in mind though that as late as before 1950 the potters did not have much of a choice than to rely on traditional technique. With the prices paid for genuine pieces the fake factories could really afford anything to accomplish a perfect copy.